In a time honoured postgame tradition of good sportsmanship, the players and coaches from the Jays and Twins line it up to congratulate each other on a great game during a Toronto Playgrounds House League Baseball ‘September Madness’ Playoff Tournament Game at Christie Pits Diamond 3 on September 5, 2018. The Toronto Playgrounds House League Baseball program offers co-ed baseball to children and youth from ages 4 through 18. Teamwork, baseball skills, and outdoor fun for all who participate. All players share playing time in a non-threatening environment. Rules are geared for age group and level of play. They are generally the same age group based rules used across North America, except we put an emphasis on sharing playing time. Players should bring their own mitts. Non-metal baseball cleats are helpful at the higher levels, but not required. Athletic supporters are recommended, but required only for the catcher position. All players receive a uniform consisting of a TP Baseball cap and team jersey, team & individual picture, and end-of-season trophy. Players in the Mosquito, Peewee, Bantam and Varsity age classifications receive pants. All coaches are volunteers, who are trained and screened. All games will be officiated by umpires with at least OBA level 1 umpire certification. Most games are on weekday evenings. Schedules for each division are available on the schedule page. Tee Ball Division games are played in Art Eggleton Park. The two Tee Ball diamonds are located in the park that is south of Bickford Park on Harbord Street between Grace Street and Montrose Avenue. 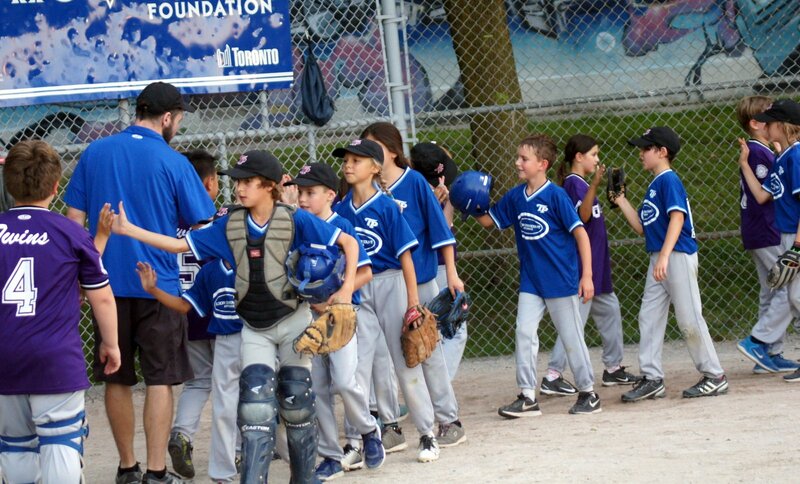 Rookie Ball, Mosquito, Peewee, Bantam and Varsity Division house league games are played at Christie Pits, Bickford Park, Trinity Bellwoods Park, Dovercourt Park, or McCormick Park. The Bantam & Varsity Divisions play on the larger Intercounty Baseball League Toronto Maple Leafs diamond (a.k.a. Dominico Field/Diamond #1) located in the northeast area of the park.